If you work in Fintech, particularly if you are regulated, this is an area you will need to get your head around. Whether it’s for applying for regulatory permissions, going through the due diligence to partner with a bank, or even hiring someone to manage Risk and Compliance, you will undoubtably come across the need to identify risks relevant to what you do and explain how you manage these. It’s actually important to get right as well as this covers how you plan to keep your company and customers safe — pretty fundamental for a business. “When we say ‘terminal’ do we mean ‘card machine’? When we say ‘funds’ do we mean ‘money’? When we say ‘reversal’ do we mean ‘refund’? And if not, do we explain why? For the task I decided to use a risk assessment. A risk assessment is an activity you do to identify all the events which could go wrong in your business and all the things you have in place to help stop these happening or fix them if they do. With this information you can understand which events should be your biggest current concern and take actions to address them. Lots of Fintechs will have to do risk assessments. The FCA require all companies registered or authorised for Open Banking to submit a risk assessment as part of their application and then annually after that. Regtechs working with banks will need to explain how they manage their risks as part of on-boarding processes. Risk assessments are part of daily life at established banks and generally require dedicated teams to help ‘non risk savvy’ people complete these due to their complexity. For the purpose of the test I imagined a startup called Smarter Theatre 🧠🎭which would access Open Banking data to make theatre recommendations to people based on their transaction data. It would also initiate payments on the behalf of customers to take advantage of the best theatre offers when these come up. Depending on the level of detail you need to go and the complexity of your business into this can get quite complicated. For a thorough approach you would want to create a list of things that could go wrong first from brainstorming, then go through an industry standard list (‘risk taxonomy’). For this example I’m just going to look at things which could go wrong for my Customers 👫. To decide how much of a problem these are you first need to work out a rating system so you can compare different risks later (‘risk rating’). Ratings are normally based on the impact and likelihood of something happening. For my impact rating scale I have used the face of the CEO if it happens. For now I won’t base it on the numbers of customers impacted but as I grew my customer base this is something I would want to add. For rating how likely something is to happen I will use a scale based on my chances of seeing the following animals in the next 24 hours. Using this scale I can now rate my risks to decide how much of a problem they are. For simplicity I’ll just take the last example to look at, my unhappy employee 😤 stealing and selling customer data. I think this would be a major issue for my customers as someone might use their data to access other accounts they have and cause them a lot of disruption. That’s a 🤬 or fuming CEO for impact. Given I only have a couple of employees I don’t think this is very likely. That said, they are only taking equity at the moment so may be desperate for money and I have only known them for a short amount of time. That gets an 🦉or not very likely. Normally you would now combine these two together to get an overall rating (‘inherent risk”). I’m going to leave this for the time being to avoid getting too complicated. To help stop it happening 🛑, I could also talk regularly with my employees to understand if they are unhappy about anything and prioritise being able to pay salaries so they are less likely to be in a situation where they are desperate for money. 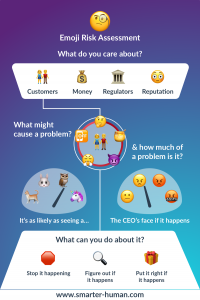 Emoji work very well for identifying the impact categories (things I want to protect) and the risk ratings (how much of a problem it is). Emoji are a lot more engaging than risk language and they can make you smile just using them. It’s hard to find emoji for the risk types (things that can go wrong), doing this for a whole risk taxonomy would really be a big job. Simple language would work better for this. The emoji library needs some additions. Why is there no robber emoji? Or a plug being pulled? Smarter Human is rethinking risk management for Fintech. We believe existing approaches to risk and compliance do not work for companies looking to deliver at pace using agile software delivery. Our mission is to make managing risk an activity which adds value rather than overheads. We are going back to basics to deconstruct the accepted ways of doing risk and compliance, test the assumptions underpinning these and rebuild solutions using what we learn. If you would like to join us on our journey, by sharing pain points, ideas and trying out our early prototypes, get in touch at hello@smarter-human.com or sign up to our Fintech Risk Hackers meetup group.